Tulisan Murtad: Who Killed Muhammad? Tafsir Ibn Abbas on Qur’an 69:44-46—(And if he had invented) and had Muhammad invented (false sayings concerning Us) lies against Us and attributed to Us that which We did not say, (We assuredly had taken him) We assuredly had taken revenge against him (by the right hand) by means of truth and proofs; it is also said this means: We assuredly had vehemently taken him. (And then severed his life artery) the life artery of Muhammad (pbuh). Tafsir Jalalayn on Qur’an 69:44-46—And had he, namely, the Prophet (s), fabricated any lies against Us, by communicating from Us that which We have not said, We would have assuredly seized him, We would have exacted vengeance [against him], as punishment, by the Right Hand, by [Our] strength and power; then We would have assuredly severed his life-artery, the aorta of the heart, a vein that connects with it, and which if severed results in that person’s death. Tafsir Ibn Kathir on Qur’an 69:46—(And then We certainly would have cut off Al-Watin from him,) Ibn ‘Abbas said, “It (Al-Watin) refers to the artery of the heart, and it is the vein that is attached to the heart.” This has also been said by ‘Ikrimah, Sa’id bin Jubayr, Al-Hakim, Qatadah, Ad-Dahhak, Muslim Al-Batin and Abu Sakhr Humayd bin Ziyad. Ibn Ishaq, p. 516—When the apostle had rested, Zaynab d. al-Harith, the wife of Sallam b. Mishkam prepared for him a roast lamb, having first inquired what joint he preferred. When she learned that it was the shoulder she put a lot of poison in it and poisoned the whole lamb. Then she brought it in and placed it before him. He took hold of the shoulder and chewed a morsel of it, but he did not swallow it. Bishr b. al-Bara b. Ma’rur who was with him took some of it as the apostle had done, but he swallowed it, while the apostle spat it out, saying, ‘This bone tells me that it is poisoned.’ Then he called for the woman and she confessed, and when he asked her what had induced her to do this she answered: ‘You know what you have done to my people. I said to myself, If he is a king I shall ease myself of him and if he is a prophet he will be informed (of what I have done).’ So the apostle let her off. 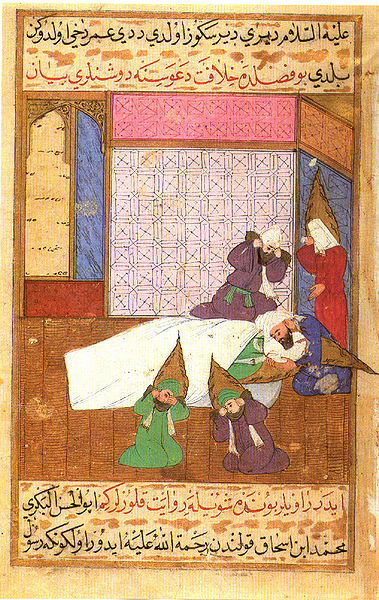 Bishr died from what he had eaten. Ibn Sa’d, Volume 2, pp. 251-252—When the Apostle of Allah, may Allah bless him, conquered Khaybar and he had peace of mind, Zaynab Bint al-Harith, the brother of Marhab, who was the spouse of Sallam Ibn Mishkam, inquired: Which part of the goat is liked by Muhammad? They said: The foreleg. Then she slaughtered one from her goats and roasted it (the meat). Then she wanted a poison which could not fail. The Jews discussed about poisons and became united on one poison. She poisoned the she-goat putting more poison on the forelegs, and shoulder. When the sun had set and the Apostle of Allah, may Allah bless him, returned after leading the people in Maghrib (sun-set) prayers, she sat by his feet. He asked her about her. She said: O Abu al-Qasim! Here is a present which I wish to offer to you. The Prophet, may Allah bless him, ordered it to be taken. It was served to him and to his Companions who were present and among those who were present was Bishr Ibn al-Bara Ibn Ma’rur. Then the Apostle of Allah, may Allah bless him, said: Come closer and have night meal. The Apostle of Allah, may Allah bless him, took the foreleg, a piece of which he put into his mouth. Bishr Ibn al-Bara took another bone and put it into his mouth. When the Apostle of Allah, may Allah bless him, ate one morsel of it Bishr ate his and other people also ate from it. Then the Apostle of Allah, may Allah bless him, said: Hold back your hands! Because this foreleg; and according to another version, the shoulder of the goat, has informed me that it is poisoned. Thereupon Bishr said: By Him Who hath made you great! I discovered it from the morsel I took. Nothing prevented me from emitting it out, but the idea that I did not like to make your food unrelishing. When you had eaten what was in your mouth, I did not like to save my life after yours, and I also thought you would not have eaten it if there was something wrong. Bishr did not rise from his seat but his color changed to that of taylsan (a green cloth). For a year the pain did not permit him to change his sides but with the help of others and then he expired. According to another version, he died before leaving his seat. He (Ibn Sa’d) said: A peace of it was dropped before a dog who ate it and died (instantaneously) without being able to move its foreleg. The Apostle of Allah sent for Zaynab Bint al-Harith and said to her: What induced you to do what you have done? She replied: You have done to my people what you have done. You have killed my father, my uncle, and my husband, so I said to myself. If you are a prophet, the foreleg will inform you; and others have said: If you are a king we will get rid of you. The Jewess returned as she had come. He (Ibn Sa’d) said: The Apostle of Allah, may Allah bless him, handed her over to the heirs of Bishr Ibn al-Bara who put her to death. Sam Shamoun, "How Allah Killed His Prophet"
Silas, "The Death of Muhammad"
Was the final moment of Muhammad's gradual poison effect, culminated in a coital death? Aisha said in Bukhari V2B62N144, "Allah took him unto Him while his head was between my chest and my neck and his saliva was mixed with my saliva." Why Is Israel the Focus of Muslim Hostility?